NEWARK, Calif.--(BUSINESS WIRE)--Feb. 1, 2019-- KB Home (NYSE: KBH) today announced the grand opening of Primrose and Rosebriar at Sanctuary Village, its two latest collections of spacious single-family new homes in Newark. Situated near Interstates 880 and 680, the Fremont BART station and the ACE® train, Sanctuary Village is ideally located in the heart of the Bay Area and convenient to Silicon Valley and major employers, including Tesla, Logitech® and Facebook. At Sanctuary Village, KB Home is offering two distinct collections of homes: Primrose and Rosebriar. The KB homes at Primrose are available in three different two-story floor plans, with up to six bedrooms and three baths, and ranging in size from 2,000 to 2,400 square feet. Pricing begins from low-$1 million. 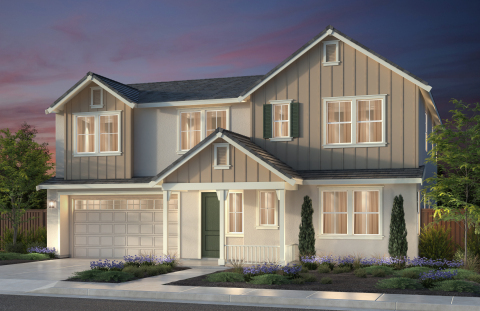 The KB homes at Rosebriar are available in three different two-story floor plans, with up to six bedrooms and four-and-a-half baths and ranging in size from 2,700 to 3,100 square feet. Pricing begins in the mid-$1 millions. Sanctuary Village is minutes from NewPark Mall and prominent schools. Nearby Central Park and Lake Elizabeth offer more than 450 acres of idyllic surroundings along with children’s play areas, sports courts, a skate park, a seasonal waterpark and boat rentals, launch and storage. Coyote Hills Regional Park, a top Bay Area destination for enthusiasts of bicycling, bird watching, jogging, nature exploration and picnicking is just minutes away. Although popular year-round, the park’s amenities are used most in the spring, summer and fall. KB Home will host a grand opening celebration at Sanctuary Village on Saturday, Feb. 2, 11 a.m.– 4 p.m., during which attendees may tour the six elegantly appointed model homes. Refreshments will be provided. The KB homes at Sanctuary Village will be built to current ENERGY STAR® certification guidelines and include WaterSense® labeled faucets and fixtures, meaning they are designed to be more energy and water efficient than most typical new and resale homes available in the area. These energy- and water-saving features are estimated to save homebuyers between $1,080 and $1,332 a year in utility costs, depending on floor plan. “With a variety of options available to home buyers to personalize their KB home based on budget and personal style, no two KB homes at Primrose and Rosebriar will be identical,” said Apostolopoulos. The Sanctuary Village sales office is located at 39815 Spadefoot Ave. in Newark, near the intersection of Cherry St. and Stevenson Blvd. For more information about Sanctuary Village or KB Home’s other new-home neighborhoods, visit www.kbhome.com or call 888-KB-HOMES.